It’s not too late to make your year-end tax deductible gift to support Americans for Peace Now. Your donation enables Peace Now and APN to do everything we do. It helps us in our efforts, in Israel and the U.S., to marshal support for positions and actions that advance the cause of peace and the two-state solution. It empowers us to work through education, activism and advocacy at all levels — from the grassroots to policymakers. It enables us to be beacons supporting what is right, without concern for what is politically easier or organizationally advantageous. It lets us speak truth to the powers that would hide it. Your tax-deductible contribution to APN is critical to the work we do, and is greatly appreciated. As a token of our gratitude, for a one-time contribution of $180 or more or a recurring donation of $15 per month, we will send you a DVD of Dror Moreh's award-winning film, The Gatekeepers. In The Gatekeepers, all six living former leaders of Israel's Shin Bet security service make the most authoritative endorsement imaginable of Shalom Achshav's position: that Israel must reach a negotiated peace agreement with a Palestinian partner. Former Shin-Bet Chief Carmi Gilon, one of the six former Shin Bet heads featured in The Gatekeepers, while speaking at a Peace Now demonstration last month, squarely aligned himself with Peace Now's pragmatic, responsible vision of Israel's future as a democracy and a Jewish state. Dror's film is a must-see. 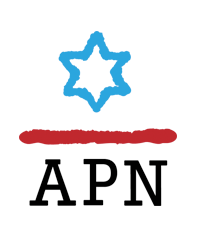 When you support APN and Shalom Achshav, you join those who work to secure Israel's future, you become a gatekeeper. P.S. Don't forget when you make your donation to write "Gatekeepers" in the comments section. All but $15 of your donation will be tax-deductible. In Israel everything is open for public debate. Sometimes that debate is so compelling that it changes people’s minds. The six living former Shin Bet directors spoke out eloquently against the occupation in the film The Gatekeepers, which I directed... All of them concur that without bold political leadership to resolve the conflict with the Palestinians, the occupation will lead us to destruction... Anyone in Israel or abroad making the same conjecture is attacked as being naïve, as a dreamer who wants to hold hands and sing "Kumbaya..."
Was Carmi Gillon (1994-96) starry eyed when he said in the film, "For Israel, it's too much of a luxury not to speak with our enemies. When we refuse to talk, we make a mistake." Or was Ami Ayalon (1996-2000) being anti-Israel when he observed, "We’re winning all the battles... and we’re losing the war" and Avi Dichter (2000-2005) "You can’t make peace using military means?" ...In my film, Yaakov Peri, who is now Israel's minister of science and technology, spoke of the accumulation of his experiences as Shin Bet head in 1988-1994: "These moments end up etched deep inside you," he said, holding his index finger near to his thumb, "and when you retire, you become a bit of a lefty." So what can you do to help? One way is to make your voice heard. Tell us Israelis how you feel. Tell us what your vision of Israel’s future is. Tell your fellow Americans. Contact your elected officials. I can’t tell you how influential American public opinion is here in Israel. To the average Israeli all the way to the highest government official, America matters. You matter. Now is the time to diversify your Israel "portfolio." Whether you visit Israel, buy its bonds, or buy its products, you must also support peace leading to an end of the occupation and leading to an establishment of a sovereign Palestinian state. And you don't have to take my word for it. Just listen to the elite of Israel's security apparatus. The testimony of the six former heads of the Shin Bet confirms that it is not naïve to want to preserve Israel as a Jewish and democratic state. It is not softhearted to see the absence of a two-state solution as a threat to Israel's survival. And it is not a bad thing to be a bit of a "lefty." If anything, it is patriotic. You too can be - and need to be - a gatekeeper to Israel’s future. Dror Moreh is an award-winning Israeli filmmaker. His most recent film, The Gatekeepers, was nominated for Best Documentary Feature at the 2013 Academy Awards. The Gatekeepers is his fourth documentary, following — among others — a film about former Prime Minister Ariel Sharon (2007). Born (1961) and raised in Jerusalem, Moreh is a graduate of Tel Aviv University’s Department of Film and Television. The Gatekeepers won several awards, including Los Angeles Film Critics Association Award for Best Documentary/Non-Fiction Film. Too many Americans advocate fighting to the last Israeli – I don't! Help us SPREAD THE LIGHT and receive "Once Upon a Country"